I am not against making New Year’s Resolutions (many of which don’t last through January), but I want to suggest something better. Ask God for His dream; His vision for you for the coming year. If you do, often it will involve ‘Dream Big,’ because usually, when God has something in store for us, it is more than we can naturally achieve. Rather, it will require faith to believe and obedience to step out and do what God wants you to do. Let me give you an example. A friend and colleague of mine, John Halverson, contacted me back in 2015, to share a call that God had given him. What was the call, the big dream: To go to the North Pole, to pray and prophesy there. Now, going to the North Pole is a big challenge, but John has taken on many challenges before; many big dreams. In 1999, John had a ‘big dream’ from God for ‘Prayer Walk America;’ to walk across America, declaring difficult times were coming and we needed to turn to God (this was before 9/11). I and others were with him, as he began the journey in International Falls, MN and walked to the Gulf of Mexico. Later, I travelled out to Oregon, to be with him as he began the second part of ‘Prayer Walk America;’ to walk from the Pacific Ocean to the Atlantic Ocean. Ron Olson, a mutual friend, helped John with the logistics for the trip and we were both with John as he completed the journey. At the end of which, he connected, by satellite, with an estimated 2 million believers around the world, who were participating with Bill Bright’s Prayer and Fasting Conference, being asked to lead them in a prayer on behalf of America and crying out to God, to once again bring revival to this land. John later walked from the Atlantic Ocean in Portugal, across Europe, the Middle East and Asia to the border of China, along with his wife Sandy, who accompanied him on each of the prayer walks. This summer of 2016, God has given him another ‘big dream;’ to go to the North Pole. The Lord has been starting to provide the finances to make it happen. If you want to support John in prayer or financially, you can contact him at Jchalvorsen@aol.com. Now, I hardly suspect that God has called you to do what John has been called to do, but I am challenging you to seek God as to what He might want you to do for Him in 2016. Write it down, pray over it and then let His Holy Spirit guide you, as to how to accomplish it. Personally, I have a list of ‘big dreams’ for the year ahead. I also have ‘big dreams’ for Church on the Hill, the church I am pastoring in Chaska, MN. How about you? 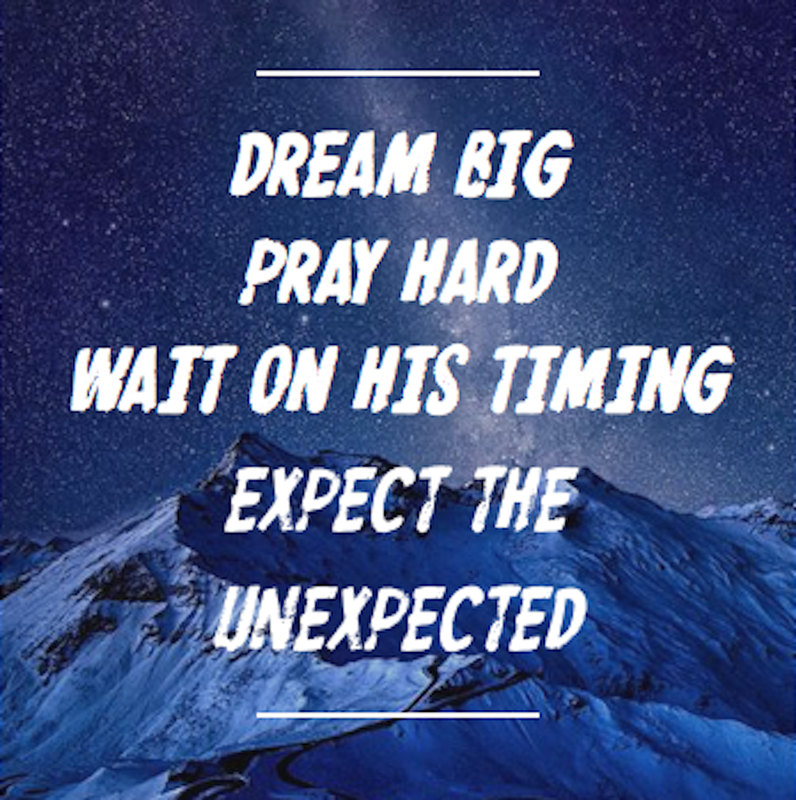 What ‘big dream’ does God want you to pursue in 2016. “More than a decade ago, Anders Ericsson and his colleagues at Berlin’s elite Academy of Music did a study with musicians. With the help of professors, they divided violinists into three groups: world-class soloists, good violinists, and those who were unlikely to play professionally. All of them started playing at roughly the same age and practiced about the same amount of time until the age of eight. That is when their practice habits diverged. The researchers found that by the age of twenty, the average players had logged about four thousand hours; the good violinists totaled about eight thousand hours; the elite performers set the standard with ten thousand hours. While there is no denying that innate ability dictates some of your upside potential, your potential is only tapped via persistent effort. Persistence is the magic bullet, and the magic numbers seems to be ten thousand. Neurologist Daniel Levitin notes: The emerging picture from such studies is that ten thousand hours of practice is required to achieve the level of mastery associated with being a world-class expert – in anything. In study after study, of composers, basketball players, fiction writers, ice skaters, concert pianists, chess players, master criminals, and what have you, this number comes up again and again. . . no one has yet found a case in which true world-class expertise is accomplished in less time. It seems that it takes the brain this long to assimilate all that it needs to know to achieve true mastery. Are we prepared to spend time in prayer on a consistent basis, both as individuals and as a church? “Having little knowledge of what God was doing elsewhere in the world, they wanted to know if there were Christians in places other than China (What a telling moment). Needless to say, they were thrilled when they heard the answer! Next they wanted to know if other believers were suffering persecution like them. Nik chose to tell them stories of Muslim converts from two different Arab countries who had suffered greatly for their witness of the Lord Jesus Christ. Strangely, his Chinese audience did not appear to respond at all to what he shared. Perhaps, Nick thought, they are so used to suffering that such stories do not move them anymore. Still, the response (of lack of it) bothered Nik, and he dragged himself off to bed deeply discouraged. If ‘the effective, fervent prayer of a righteous man avail much’ (James 5:16), what happens when that many believers pray? And, of course, it is not only the Chinese who prayed. Believers across the planet were praying the 10/20 window.